As every year, everyone started running towards the Rolex booth right after the opening of the Baselworld exhibition. Rumours about a new Rolex GMT-Master II seemed to be true, although there wasn’t a Coke or Pepsi configuration to show. Instead, Rolex came up with a blue and black configuration. New was the Rolex Yacht-Master II in stainless steel. More about those models later. 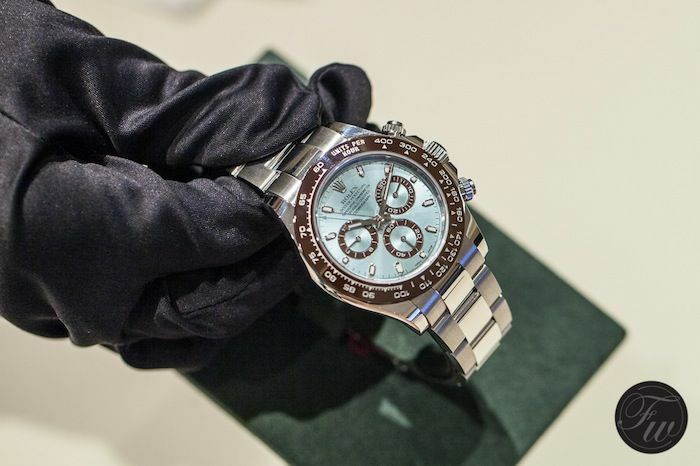 Let’s focus on the brand new Rolex Daytona reference 116506 first! Although Rolex doesn’t celebrate it officially, it’s the 50th anniversary of the famous Daytona model. The all platinum version of the iconic Rolex Cosmograph Daytona is not a limited edition nor is it a time limited edition. It is just regular collection. The press release just briefly mentioned the 50th anniversary of the Daytona, but that’s it. During our appointment with Rolex in Baselworld, this was confirmed again that Rolex just doesn’t celebrate these type of anniversaries. Fine by us, of course. Rolex is one of the few brands that doesn’t drown themselves in limited edition models. Two ingredients that we’ve seen before at Rolex, one on purpose and the other by accident. Let’s start with the chestnut or marone colors on the dial. You probably remember the Daytona with El Primero movement that received the nick name ‘Compax Marone’ or ‘Patrizzi’ because of the discolored sub counters. They went slightly brown which gave them a nice vintage / patina-ish look. 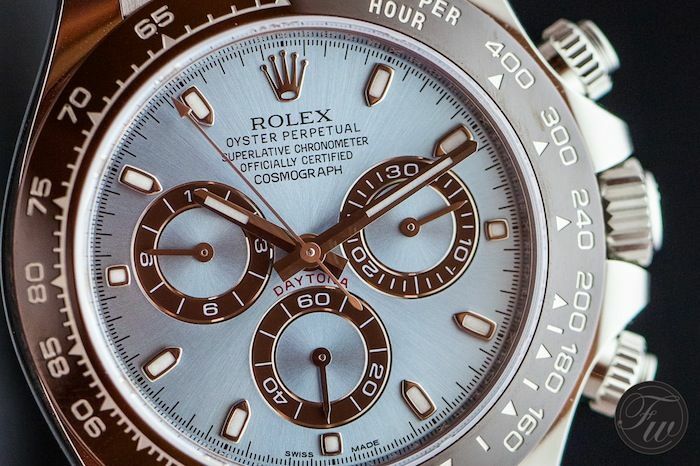 This brown-ish Daytona became one of the most sought-after modern Daytona models. The Ice Blue dial is something we’ve seen before in the Rolex collection. The all platinum Day-Date with president bracelet was also available with an ice blue dial. A very popular combination, as many white gold Day-Date owners want to buy (or did buy) an Ice Blue replacement dial for theirs. 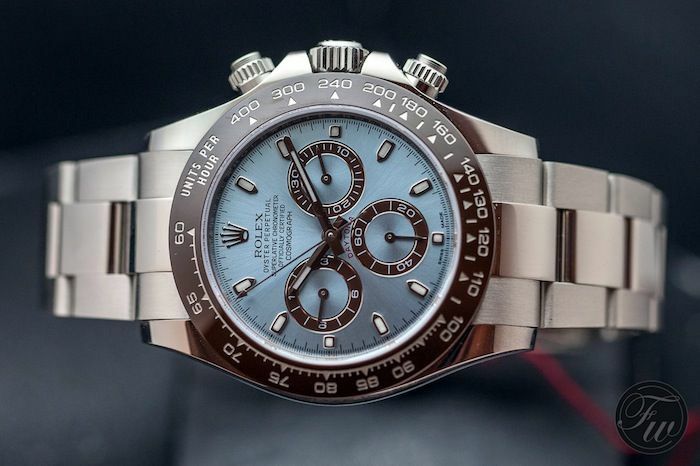 Either Rolex listened carefully to the demands from the market or it is all based on coincidence, fact is that Rolex put a very nice Daytona on the market with this reference 166506 in all platinum. The Cerachrom ceramic bezel is very legible due to the use of a thin layer of platinum for the numerals and graduations. The platinum layer was applied by the use of PVD. From what we’ve heard and witnessed during the Baselworld show, people are mixed about this watch. Not only because of the price tag of 50.940 Euro (excluding VAT) but also because of the use of colors. However, after having seen it in the flesh and better pictures than the iPhone stuff that appeared on-line on the first day of introduction, we think it is a beautiful watch. We hope that our pictures do the watch a bit more justice than the quick snaps that people took in a hurry through the displays of the Rolex booth. Leave a comment or note below and tell us what you think of the new all platinum Rolex Cosmograph Daytona.